We just celebrated the beginning of the new Jewish year, 5778, Rosh Hashanah, literally “head of the year.” Jews celebrate not with frivolity and booze, but with contemplation and prayer. We are entering the period before the Day of Judgement, Yom Kippur. We want to think about what we’ve accomplished, how we treated others, our relationships with people and G-d. Many include a “new” fruit as part of their new year celebration. This beautiful custom entails eating a fruit that one has not eaten in a while or one that has not been encountered before. After making a blessing on the fruit, there is a blessing thanking G-d for bringing us to this season. Then the fruit is eaten. 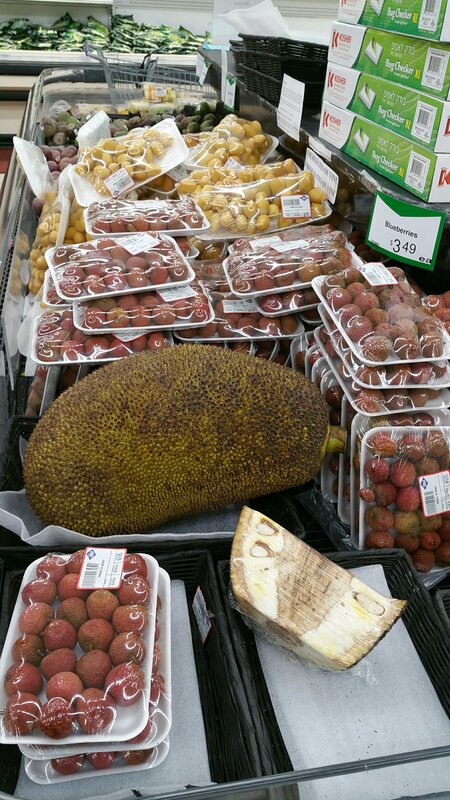 Our local kosher supermarket, Seven Mile Market, stocked numerous “exotic” options to choose from: lychees, fresh figs on the stem, golden berries, jackfruit, and prickly pear to name a few. This year I bought lychees. (I chickened out from buying a slice of jackfruit.) I can’t remember if I ever ate fresh ones before! It was a delightful experience. New beginnings are the theme of this season, returning our thoughts to our core values and making use of the ability to turn ourselves away from directions we may have taken that stray from the true path. I have the opportunity to make amends, to look inside and see where I’ve erred. G-d allows me to start over again, freshly invigorated and reoriented if I’ve gone astray. I feel doubly blessed this new year having started a new position and new career after a long job search. It’s a new beginning in many ways, working for a non-profit organization that strengthens our community by helping neighbors acquire and maintain housing… among other benefits. It’s a chance for me to give back in Gratitude for the many kindnesses bestowed on me. I’m sending all wishes for a good, healthy new year in 5778. There’s a lot to be said about the practice of contemplation and self-improvement. In these days between the Jewish New Year, Rosh Hashanah, and the Day of Atonement, Yom Kippur—the so-called Ten Days of Repentance—we turn our thoughts toward our actions and character traits which have allowed us to act in a particular manner. This period is a time for appreciation of our freedom to use our wills for good or for selfish ends. We don’t flagellate ourselves when we find ourselves lacking; rather, we contemplate the means to change ourselves for the better. I liken this week to an employee performance review. Like the yearly progress assessment, we review our success in achieving goals set in the previous season and we formulate future goals. Where do I excel? How can I parlay this strength toward future endeavors? Where can I be better? What tools can I use to improve what is sub-par? Have I failed utterly in any area? What is taking me off track? And if I just can’t proceed in that positive direction yet, what is holding me back? On Yom Kippur, we give a full accounting to the Boss and state how we may improve ourselves toward fulfilling the Company’s goals. Rather than castigate and flagellate myself for perceived imperfections, I can choose to look at this annual review as an opportunity to learn more about myself. Others may quake in their shoes, fearing punishment and retribution, but I choose to take the opportunity to reboot myself as it were, and get a fresh start. Rabbi Ezra Schwartz reminded us on Rosh Hashanah that we are not bad people. We just need improvements. Improvements. This thought makes me … happy. Otherwise, I would be so despondent all of the time, wallowing in guilt and unhappiness for my failures and inconsistencies. If I could not take the opportunity to move on from today into an improved tomorrow, I would feel like the executioner’s sword was inching closer and closer—sure doom—defining my fate. We have so many characteristics that make us who we are. Some are expressed at the wrong times, others are not expressed often enough. 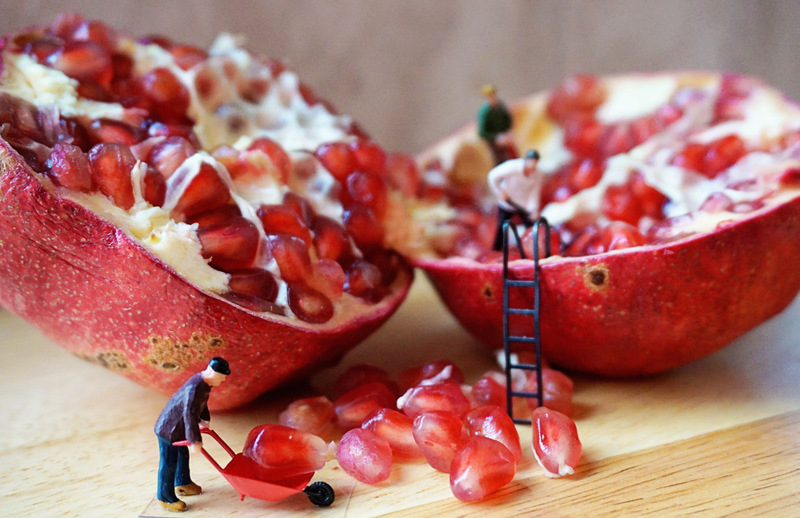 Our characteristics are many, like the seeds of the pomegranate which—once you find them and use them—can be a delight for the eye and palate. Instead of facing severe punishment, we are given a chance to take our measure accurately, and alter the pattern. The Hebrew word middah (מִדָה) literally means “a measurement,” and also refers to character traits. How poorly clothing would fit if the tailor could not make adjustments to the pattern. So, too, we are given the ability to contemplate the pattern and adjust the reality. We are given a new chance at life, forgiveness, and our eyes are opened to our true characters! Yeah, it’s scary facing our shortcomings. I don’t like admitting where I’ve failed, fallen short, not risen to the moment or shown the darker side of myself. but rather than quake with trepidation, I’m calculating, building, planning, adjusting. I’m using my Ten Days of Repentance to adjust the template and shift the pattern. Hope! Everyone gets a second chance; not everyone can use it properly. I’m taking this opportunity to increase my internal awareness and assess how good it can get. This is my choice, leading to happiness. For all of my friends and not-yet friends, I wish you a meaningful period of contemplation, leading to a fulfilling Yom Kippur/Day of Atonement, to be sealed in the Book of Life for a good year! Aaaaah, the promised end of oppressive heat: September! Cooler temps are on the way! I can go outside again!!! I hate looking at all of these photos of happy hikers, joggers, runners, sunbathers. I seethe in jealousy. Why? I’m a person who can’t tolerate temperatures above 80ºF (27ºC). I hang out at the freezer cabinets in the supermarket, fanning myself. I fill my cup with ice and blow on it for cheap air conditioning. I’m the person in the office saying, “Why is it so hot in here?” while my co-workers shiver in sweaters and turn on the heaters under their desks. Little Miss Furnace, that’s me. So when September comes, when the leaves start to brown and rain from the trees and cooler air wafts in from the north, I revel; relief is imminent! I’ve wondered if I can change my heet-feeling nature with biofeedback, accupuncture, or hypnosis. It’s a metabolic flaw, my inability to properly regulate my inner temperature. Thus, I gloat over cold drinks like sludgees, welcome cloudy days and summer showers. 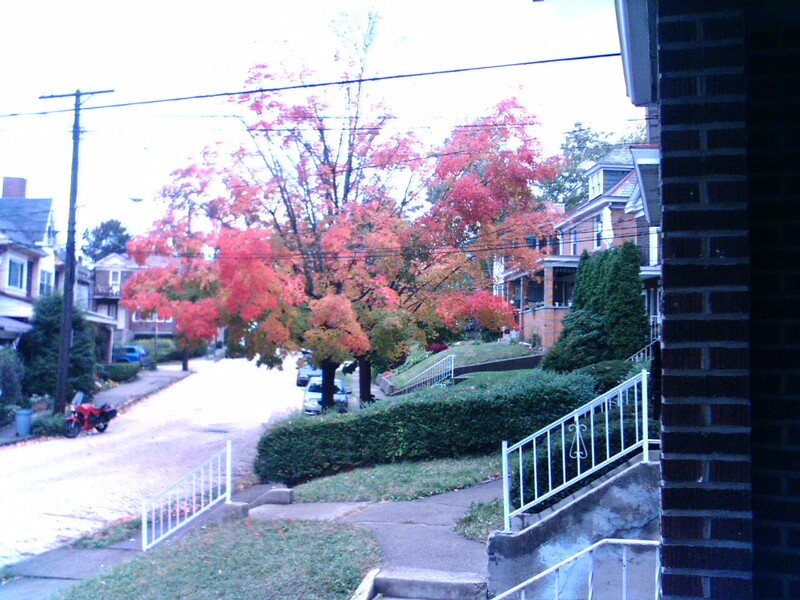 and anxiously await the New Year (the Jewish New Year, that is) which heralds the advent of cooler weather.